Custom Log Home - True Ski-in/Ski-Out - Secluded & Beautiful! 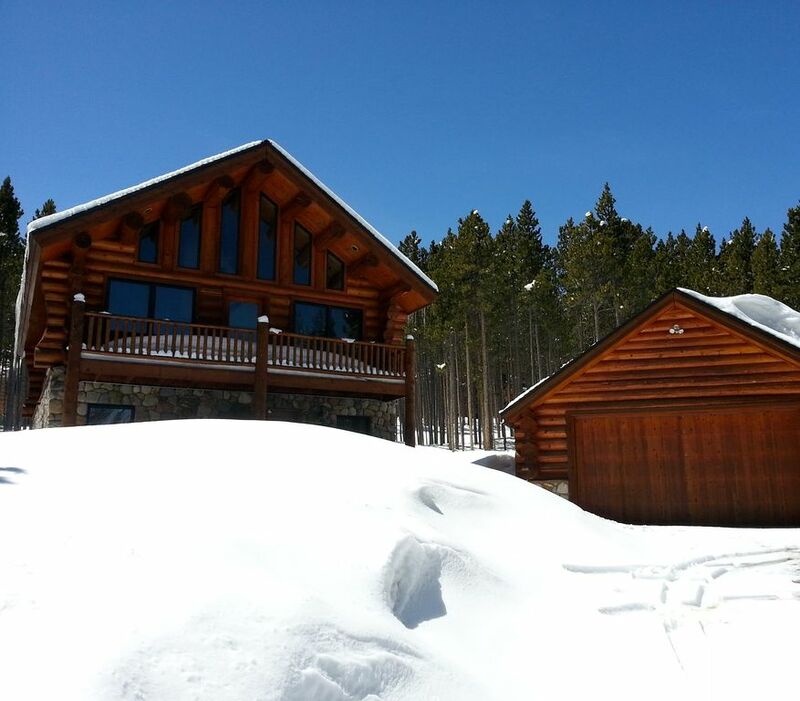 We have a three bedroom, two bath, Ski-in/Ski-out Custom Log Home above Peak 8 in Breckenridge, Colorado. Check out our attached video to see just how easy it is to ski home! We have hardwood and slate floors with radiant heat. Our logs, Red Cedar, came from Canada. You will find a natural river rock fireplace in the living room and in the master bedroom along with antique furniture throughout this log home. A full kitchen with granite countertops awaits you, unless you enjoy eating at the various wonderful restaurants that Breckenridge has to offer. There are full laundry facilities for your convenience. There is a separate two car log garage which saves you from any snow removal on your vehicle. Our bedrooms have queen-size pillow top mattresses with down comforters and flannel sheets. There is a surround sound audio/visual system in the living room and master bedroom. You will enjoy separate DVDs and televisions in all bedrooms along with a DVD player in the living room. DirecTV satellite TV is provided. We have pre-recorded DVDs, but we always recommend bringing your favorites along with compact discs for music. LCD TV's along with DVD players are also in all the bedrooms. Our home is located above the base of Peak Eight, adjacent to Trygves Run. You ski down to any of the major lifts on Peak Eight, and we have a private trail directly into our front door, right off of Trygves Run. Our ski home trail leads you to over a thousand acres of National Forest (the Breckenridge Ski Area). Trygves Run is also where lessons are offered for beginners. You'll find it easier to come home for lunch than to eat at any of the restaurants on the mountain. Whether you are on the top of Peak 6, 7, 8, 9, or 10, you are usually just one lift ride away from skiing or boarding to your front door. Also, once you start soaking in your private outdoor jacuzzi tub, it's even harder to go back skiing. We are located five minutes above the town of Breckenridge. Breckenridge has a wide variety of excellent restaurants, and a wide variety of activities including ice skating, cross country skiing (near our home), just to name a few. You can ski from our home down to town and take a free shuttle to Keystone and A-Basin. Vail also offers a shuttle service. You never have to worry about paying for parking, or driving your car when you are ready to ski! We are a definite "NON-SMOKING" home! To sum up our home, a guest last year wrote, "We have skied all over the United States and Canada (including Aspen and Deer Valley), and the location, ambience, and warmth we felt in your beautiful home is unsurpassed. We look forward to being back next year! Finally, in case you have a larger group then our log home will accommodate, we have a second home three doors away that sleeps 14, and enjoys the same ski home trail as our log cabin. Feel free to ask us about this home. Please contact us (see our 'Toll Free' number and/or our e-mail link below). Just ask - and we can forward you more pictures or answer any questions you might have. We hope you come to stay with us, or at least visit the Breckenridge area for all the great things it has to offer! Private Hot Tub for relaxing after a long day of skiing. Hot Tub or Jacuzzi, Private Ski Trail into back door! Adjacent to Ski Area! We had a such a great holiday at this fantastic house. This place has loads of character, exceptionally well stocked with supplies. It felt very cosy and we really enjoyed the hot tub and use of toboggan in the garage. We found it much easier walking out to the slope via the ski in trail at the back of the house, rather than down the drive and along the road a little way. Dave was so easy to get hold of with any questions from pre booking until after we’d checked out. We only wished we could have stayed for 2 weeks - next time! A beautiful and well-maintained home, in a great location! We had a great time in this mountain home. The location is as described; it could not be more convenient for ski-in, and it is a relatively short walk for ski-out. The furnishings fit to the home, and add a certain charm. The galley-style kitchen is efficient and well stocked (we ate most of our meals at home). Everything in the house worked well, including the heating, the hot water, and the hot tub. The Wifi was decently fast, and had good coverage. The owner responded quickly to all of my questions, and provided clear information and guidelines. We would definitely stay here again. Awesome location, awesome house, awesome hosts! What a great stay! Dave’s house is fantastic. Couldn’t be a better location and the house itself is a perfect ski house. My family and I loved our stay and can’t wait to come back! Can’t say enough good things! Did I mention the hottub?!? Beautiful real log cabin !!!! What an amazing home !!! A beautiful real log cabin perched high on Breckenridge with all the comforts of home... Dave is a great guy easy to work with and very informative. We really enjoyed our stay and we are very grateful that he shared his home with us. Thank you very much!! We had an amazing ski trip. The log home was well stocked and the location was perfect for ski/in ski/out. The garage was a great treat because we had a lot of snow during our stay. Overall we were very pleased and would definitely recommend this home to everyone. Thanks Dave! Spending New Year’s Eve at this beautiful log home was amazing for our family of 5. We watched the fireworks sipping champagne from the living room window with a cozy fire and did not have to bear the negative temps outside to enjoy them. The owner went out of his way multiple times to assist me when I had questions. The house was beautiful and fully equipped. And, being able to ski right up to the door after an exhausting day was fabulous! Highly recommend!